Have you ever wondered where exactly extra virgin olive oil comes from? The answer, quite simply, is olives. That is, unless you're in Hobbs, New Mexico, where the slippery substance is currently pouring from the eyes of a bronze statue of the Virgin Mary inside a church. The "weeping" Mary has not only stunned the local community, but it's also quickly becoming a pilgrimage site for the faithful who want a glimpse of what many believe may be a divine happening. The 7-foot, hollow bronze sculpture, which sits inside the Our Lady of Guadalupe Catholic Church, seems to have started "crying" back in May. 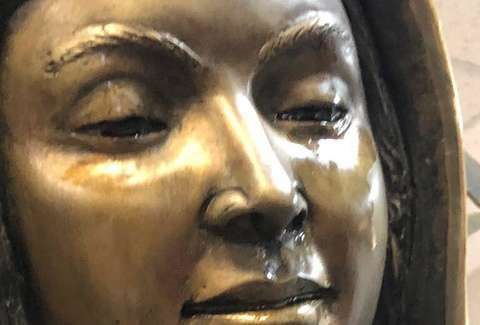 Parishioners first noticed something streaming from the statue's eyes on May 20 -- Pentecost Sunday -- which prompted a bit of an investigation. That's when they realized it wasn't simply normal condensation, but something very different. An investigator from the Roman Catholic Diocese of Las Cruces was called, who determined the liquid mysteriously emanating from the figure actually had the same chemical makeup as an olive oil that had been treated with a perfume, according to a report from The Washington Post. The statue has since "wept" the same liquid several more times, baffling church leaders, experts, and locals alike. As for how or why this may be happening, the church's priest, Rev. Jose Segura, says that there are cameras that would have captured any evidence of it being caused by a person or some other environmental issue. Investigators also checked the surrounding area and ceiling for a source and found no dripping or anomalies that could be linked to the oil. It's not just a little bit of liquid pouring out, either. The WaPo story says that nearly 17 ounces of the stuff has streamed from around the eye area -- enough to stream all the way down the statue. Naturally, some are chalking it up to the supernatural, and it has thus become a highly holy site for many who are flocking to the church to pray and witness the curious scene. Of course, there are also skeptics and others who think it may all just be a hoax, but investigators still have no reason to believe it's manmade.